My bedroom is one of my favourite places. When we moved to this house 10 years ago, I decided that I wanted one wall of my room to be bright red. Some people think it’s a bit OTT, but I adore it. My room is quite large, and it’s a very light, airy space. One wall is entirely windows, whilst the opposite one is all built in wardrobes. I’m very lucky in that I technically have seven wardrobes (3 doubles and one single!) and yes they are all crammed full with clothes (colour & type coordinated, of course). 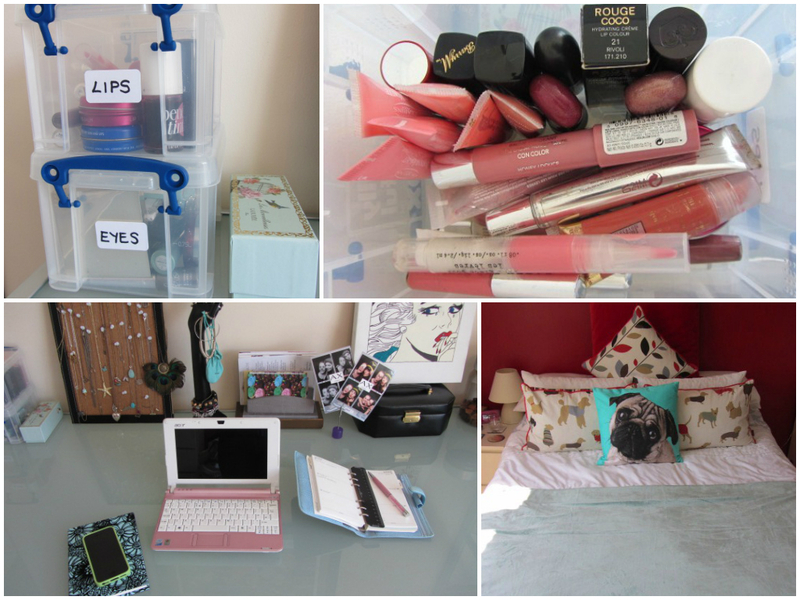 So I thought I’d give you a little insight into my little haven. I keep my costume jewellery necklaces in a vintage collar box that a friend gave me for a birthday. I bought the blue and white bowl half way down a mountain in Morocco, and then realised I would have to get it to the bottom without breaking it! When I have my own place I will use it for other things, but at the moment it’s my bracelet bowl. 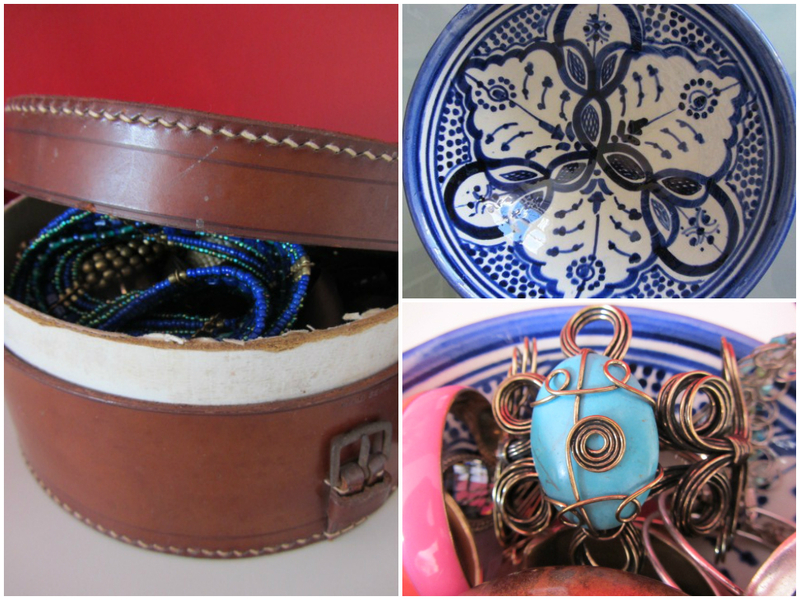 The turquoise bracelet is also from Morocco and it’s one of my favourites. 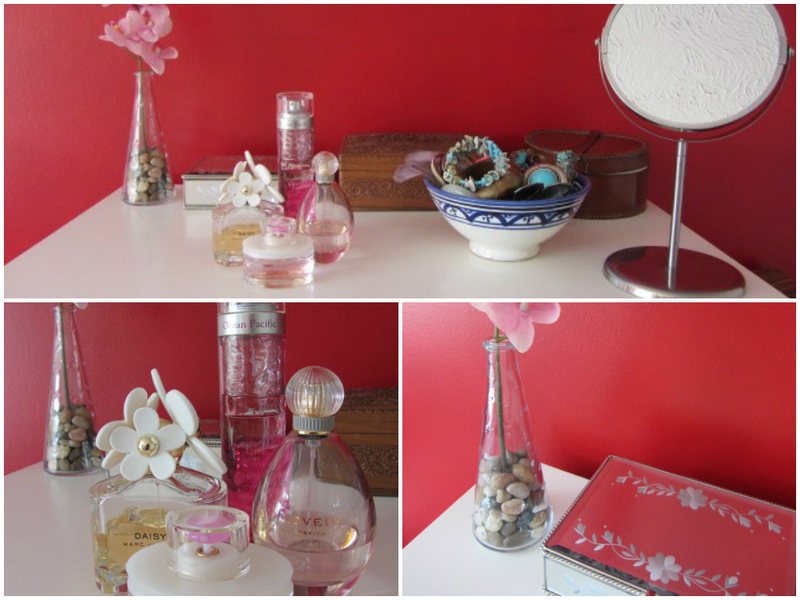 Both the bowl and collar box live on my trusty Ikea chest of drawers, along with a couple of other jewellery boxes, my perfumes and makeup mirror. This is just a little selection of some of the perfumes I alternate for Spring. Daisy by Marc Jacobs*, Lovely by Sarah Jessica Parker*, Par Amour Toujour by Clarins* & Ocean Pacific by Ocean Pacific. The mirrored jewellery box is one of the first presents my boyfriend ever bought me. I’ve made a few of these hanging hearts, but this spotty one with an S is my favourite. 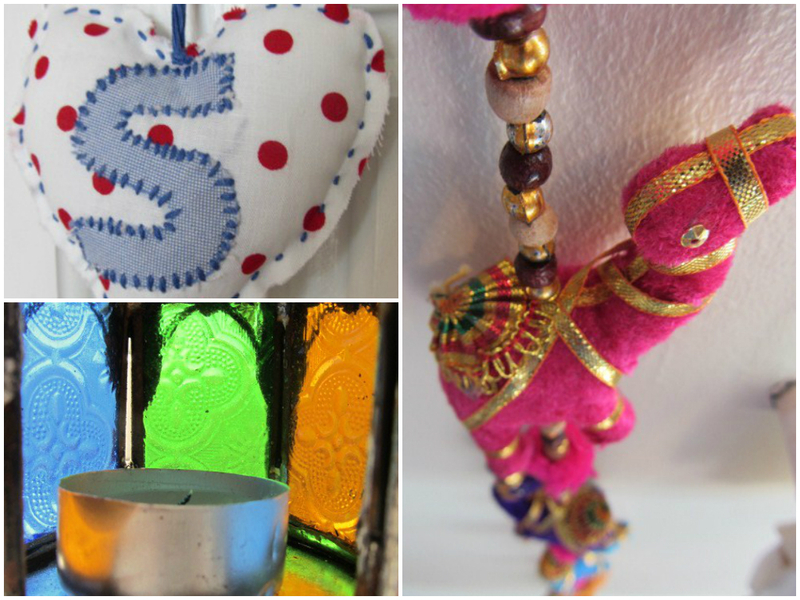 The Moroccan lamp lives on my window sill so that the light can shine through the coloured glass panels, and the camels from Qatar hang from the curtain tie back. My desk is home to a mixture of things. 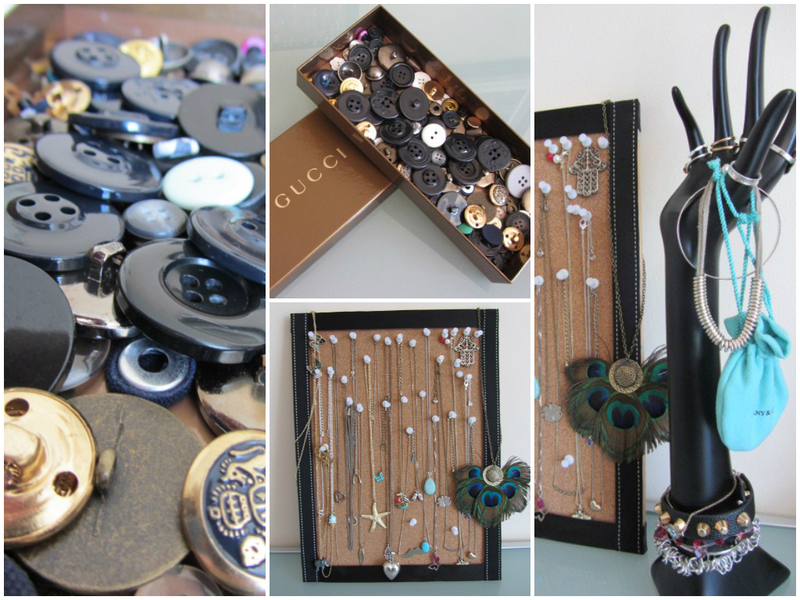 I’m forever loosing button off things, so I keep all my spare buttons in an old Gucci chocolate box. I made this necklace board from a cork pin board, some ribbon & pins. Very simple but great for keeping necklaces un-tangled. My jewellery hand was a gift a few years ago. I have too many lip & eye products for my makeup drawer so these live on my desk. It’s actually a dining table (again from Ikea) but when I was at school and uni it was big enough to spread all my books around on, but now it’s my blogging space. My bed is of course one of my favourite things! What’s your bedroom like? Is it bright like mine or is it decorated in more muted colours?